It’s been a long time coming. Film has been on the way out for years, as studios have increasingly turned to cheaper, easier and more efficient alternatives. Only now has it finally dropped down the chain to York Student Cinema. Yes, after a long year (and at least 3 showings of Frozen) we have finally scraped together the money to install our new digital projector! And it’s very good. The brightness and the clarity of the picture is just incredible. I almost feel sorry for our old Victoria 5; the company’s tagline, ‘Realer than reel’, adds insult to injury. Now trailers come in the compact form of a memory stick, while whole films will be posted to us on hard drives we need only plug in, and hunting down tape for splicing reels together has been replaced by playlisting capabilities. Many people feel that 35mm has a sort of old-timey romance to it that cannot be replicated with pixels. Perhaps the nostalgia emerges from the inevitable break with the glorious cinematic history of film. The idea of the breathtaking period glamour of Gone With the Wind having been captured on anything other than celluloid is unthinkable, and who can help but admire the ingenuity required to create lightsabers without the use of modern special effects? The transition to digital provides a marked departure from the the safe rolls of film that have provided us with comedy, drama and wonder since the days of Georges Méliès. The list of directors mourning the death of film includes Christopher Nolan, Quentin Tarantino and Stephen Spielberg. 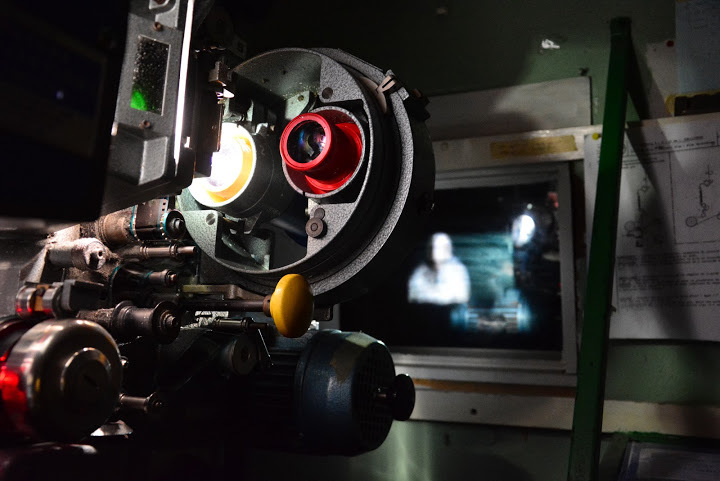 We, the projectionists, have no idea what it’s like on the front line. We just show and appreciate the end result, marvelling at how someone managed to fit such a wealth of beauty and visual spectacle into such tiny frames. We are very privileged to have seen movies like very few people get to see them- as physical things to touch and hold. We run it through our hands, chop it up, stick it back together, mangle it, and (after much work and a lot of swearing) put it on display for everyone to see. It’s an under-appreciated job, being the final cog in the machine ensuring that the long process pays off, and that the film gets the showing it deserves. Certainly, there are things I’ll miss. There was that one time we tried to identify a woman in a frame of The Counsellor (it was Brad Pitt with long hair). And the moment when the projector decided to burn the film just after Johnny Depp said an embarrassingly bad line in The Lone Ranger, as if it had just given up. Or the day I officially qualified as a chief projectionist, a happily uneventful showing of Don Jon. But do not expect me to swing a bell about the city, pronouncing that the end is nigh. I have experienced the difficulties with film first-hand. I know it takes up a lot of space. I know it requires a lot of preparation. I know it has the tendency to mangle and burn at the slightest mistake in setting it up. It’s tricky but has an undeniably unique quality, and I don’t think this is the end of the road: many directors are still actively committed to shooting 35mm and, among others, J.J. Abrams’ untitled Star Wars instalment will be hearkening back to the franchise’s pre-digital days by using film stock. It’s given us many years of mostly good, if occasionally frustrating and unreliable, work. Time for our old Victoria 5 to take a step back and and let one of those new digital whippersnappers pick up the slack. To anyone amazed by my suddenly brilliant photography skills, I should add that these gorgeous photos were taken by someone at York Student Cinema (I know not who!). So I was watching this Blank on Blank interview with Heath Ledger, and something he said caught my ear. Anyone who has seen Brokeback Mountain should be left in no doubt that Heath Ledger was a very talented actor. I found it really interesting that someone as brilliant and seemingly chilled as Heath had all these insecurities underneath. It reminded me of an article I read a few weeks ago, describing a psychological phenomenon called ‘Imposter Syndrome’. It’s essentially a label given to a constant feeling of inferiority and failure to acknowledge ones own accomplishments. Known to be especially prevalent among female academics, people with the syndrome admit feeling that their achievements have been built in large part through luck, and any minute now everyone is going to realise that they’re just not good enough, despite evidence of their success. And imposterism has real consequences. Many intelligent women will turn down more ambitious projects or careers simply because they feel a fake. Is it partially responsible for the relatively small proportion of women in STEM subjects? Perhaps. All this felt familiar to me. It was something I kept to myself for a long time, but I’ve never really felt comfortable academically. I find it very difficult to get to grips with (and then retain) certain ideas and my memory is just awful. I often feel out of my depth and have doubts about whether I’ve picked the right subject. My attention span is virtually non-existent, making revision a constant struggle. Combining these insecurities with my tendency to hang around gorgeous, funny, intelligent people, means that a lurking feeling of inferiority is never far away. By comparing my insides to others’ outsides, I will always come up short. But something clicked when I watched Heath’s interview. He said that without his doubts ‘I wouldn’t try as hard to overcome.’ I listened to it again. I guess that’s true for me too. Of course, I could do without the stress that accompanies them (and I’m working on that), but I can’t deny the motivation they’ve given me to keep at what I’m doing and struggle on. If you’re still in any doubt that these insecurities are more common than you thought, here are a few other talentless low-achievers who have spoken in public about feeling like an imposter: Tina Fey, Emma Watson, Coldplay’s Chris Martin, Jodie Foster, Don Cheadle, Kate Winslet, Denzel Washington and Meryl Streep. I don’t know about you, but that seems like pretty good company to me. And these people all managed to push through those feelings and get to where they are today. Forgive me if you feel I’m airing my dirty laundry. That wasn’t my intention. Generally I use my blog as more of an escape and keep things light; I won’t report on my neuroses and anxieties unless they have wider significance (because hey, that’s what diaries and boyfriends are for!). But I think it’s important to see behind the facade every now and then. To anyone reading who feels that they may have a streak of imposterism running through them (and you can find out here): you’re not alone. All around you, other people are struggling with exactly the same thing, to a greater or lesser extent. You are not the only person that feels inadequate. You do not need to constantly compare yourself to the people around you because you are your own person with your own strengths and weaknesses; if you feel you don’t measure up to someone else in one way, you more than make up for it in others, whether you realise it or not. Have more confidence, extend yourself, be brave. I’m rooting for you. ok, so I got into York, yay! Very excited. My nervousness has sort of ebbed away like a puddle, but I’m sure I’ll be hit by another tidal wave as the time gets nearer. It does mean that I have a lot of stuff to buy, the usual I guess- pans, sheets, tupperware, those little poofy things you use for showering… But I’ve also had to set aside a load of money for clothes. Anyone who has seen me about at 6th form can see that I’ve basically stuck to a uniform of tees and jeans for the majority of the two years. This is partly because it’s comfy, partly because I’m usually broke (after spending all my money on music) and partly because I couldn’t be bothered. So now my jeans have all decided to start springing holes everywhere, giving me an excuse to start from scratch. Which is fine! I put together a load of images to try and get an idea of what stuff I needed to get and budget everything- I think it really seems to shout ‘dapper, with a hint of hobo’. 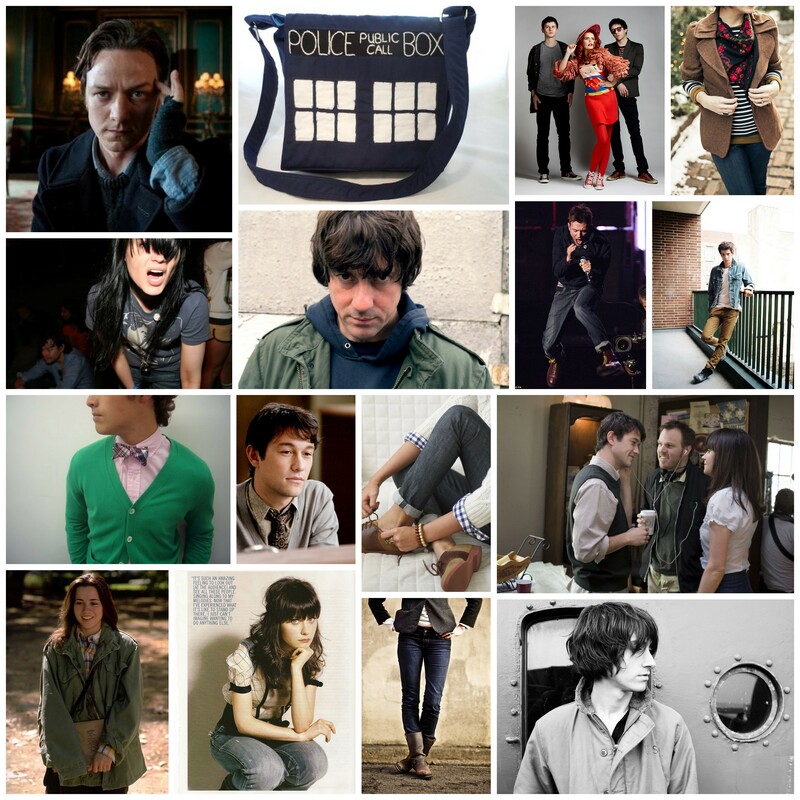 It’s an amalgamation of all the little stylish touches that interest me, from JGL’s adorable cardigan in (500) Days of Summer to Graham Coxon’s pretty grungy look by way of geeky fashion. Managed to FINALLY track down a decent army jacket in a vintage shop in Newark today, can’t wait to try it out (very much inspired by Lindsay in Freaks and Geeks! ).